It’s Spring! Normally I’d be thinking of crocuses and daffodils and waiting for the hibiscus to send out thick buds that will turn into giant red flowers. But this season has started off strangely. The bushes in our backyard are showing puffs of white instead of the colorful promise of hydrangeas. Branches from the pine trees are touching the ground with the weight of wet snow. What is going on? This is the fourth nor’easter we’ve had this month, bringing snow and sleet at a time when we should be having a gentle shift into the next season. We speak about global warming and yet we see snow in Spring? I remember the saying that March comes in like a lion and goes out like a lamb. I also can recall one year that we had snow in the beginning of April. So things do sometimes defy expectations. However, we are in a time of large shifts in our climate. It’s hard to ignore the changes that are taking place across the world. The atmosphere is heating up, causing glaciers to melt, oceans to rise, more floods, and fires in drier lands. And yet, we can still have snow at the beginning of Spring. What we do affects things, whether it is personally or globally. Our climate has changed over the millennia but we seem to be hurrying things up lately. I hope that our current leaders work to minimize climate changes rather than take a short-term approach for political gains. Our planet is a marvelous place; let’s try our best to support it. This past week was full of a variety of weathers. It was raining. It was snowing. The wind was blowing like mad. And then the sun came out, lighting up the sky as if nothing had happened. But plenty had happened. It was a nor’easter that affected lots of people. Some people lost power. Neighborhoods all along the coasts expected flooding after the wind moved out to sea and would probably affect the tides coming in. 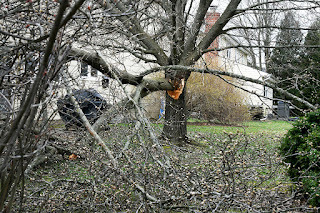 Our backyard trees weathered the onslaught but our neighbor’s Bradford Pear tree wasn’t so lucky. A large branch broke off, spreading wood and the buds of new leaves across both our yards. The downed branch fell onto a bush that has been in our yard for over forty years, each summer sending flowers and new stems as a reminder that summer was approaching. But it left both our roofs untouched, thank goodness. It reminds me not to take anything for granted. Trees are so strong and impressive yet they, too, are part of the progression of life. It’s important to appreciate the present because that is all we truly have. Even as we plan for the future we can live moment to moment along the way. Which is good to remember because another rain/snow storm is expected. Minnesota's harsh climate is often responsible for severe damage to landscape plants. Winter sun, wind, and cold temperatures can bleach and desiccate evergreen foliage, damage bark, and injure or kill branches, flowerbuds, and roots. Snow and ice can break branches and topple entire trees. Salt used for deicing streets, sidewalks, and parking lots is harmful to landscape plantings. Winter food shortages force rodents and deer to feed on bark, twigs, flowerbuds, and foliage, injuring and sometimes killing trees and shrubs. All is not bleak, however, as landscape plants can be protected to minimize some of this injury. Anyone who has lived around trees is all too familiar with the dreaded “crack” that often follows a major snowstorm. Spring storms can be devastating as the heavy, wet snow can prove to be too much for some trees. Although cottonwoods, elms, willows and poplars tend to be hit the hardest, due to their soft, brittle wood, no trees are completely safe with heavy snow or high winds. The method in which you care for your trees after a snowstorm will play a major role in their recovery.